Click here for YouTube video of the performance. Heartiest congratulations to the Senior Choir who put on a tremendous performance at the CIT Cork School of Music on Friday Oct 17th. Unfortunately this is where the journey ended and CBS did not qualify for the final. However, it has been a terrific few months. Well done to all the students and particularly to Ms. Dowling and Ms. Evison. Many thanks too to Ms. Meaney and accompanist Martin O'Reilly for their valued help, expertise and support. It was also wonderful to meet up with former CBS students Conor Brassil and Sean Grace who are currently studying music in Cork. Enjoy the photos below which follow the choir over the course of the day's preparations, rehearsals and final performance. See below for television details. The Irish Christian Brothers came to Kilkenny in 1859 and laid the foundation stone of a new school on the present site. The school was formally opened on 24th September 1860. “Their advent will be a boom and a blessing to Kilkenny”. So wrote a correspondent to the Kilkenny Journal on October 13th, 1860 following his visit to the new Christian Brothers School on James’s Street in an article entitled “A Peep at the Christian Schools”. He recalls the courteous manner in which he was received by the Brothers. He observes the order and discipline which they had already established. Yet the pupils within the school seemed as joyous as the “playful truants outside”, who could not gain entrance because of severe overcrowding. He had “peeped in” just in time to hear the singing class and was astonished by the taste and accuracy with which they sang. These pupils also learned history, poetry and of course Gaeilge as well as the “solid sciences”. An all boys school with a present enrolment of 670 students, the school which is located on its original campus at James’s Street has a long and proud tradition in promoting Gaelic games, the Arts and a wide range of Irish cultural activities. With more than 150 years of excellence in teaching and learning and a wide range of achievements in co-curricular and extra-curricular activities the school has a highly qualified, dedicated and enthusiastic staff that delivers a diverse and comprehensive curriculum. In more recent years the school has been a dominant force in Leinster and All-Ireland Colleges hurling, winning back to back Leinster senior titles in 2013 and 2014 and Leinster and All Ireland Junior Colleges in 2014. The school’s motto “Scientia ac Labore”, (Knowledge through hard work), encapsulates the spirit of diligence and enthusiasm which permeates all aspects of life at CBS Kilkenny. For the past 150 years CBS James’s Street Kilkenny has produced leaders of Church and State. The hallmarks of its approach to education include an holistic educational experience and a desire for excellence with the belief that this can be best achieved in a school community where people are happy and relationships are good as well as a certain independent spirit which is perhaps fitting on the site where Blessed Edmund Ignatius Rice got his first education. 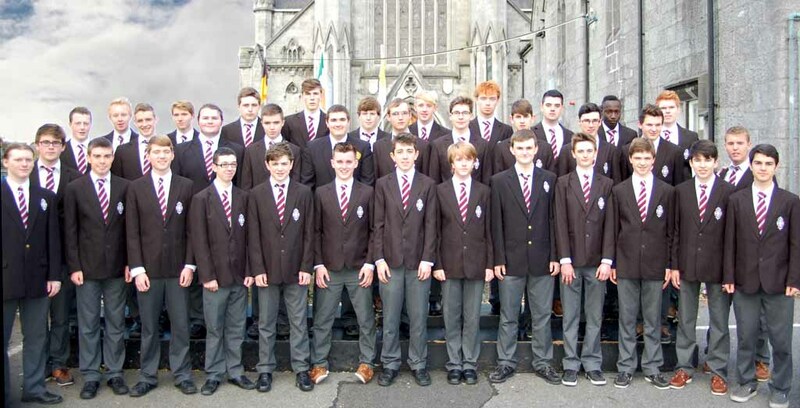 CBS Kilkenny, which lies within the walls of the city, has enjoyed a rich, varied and vibrant music tradition, with singing being part of the school curriculum since 1860. 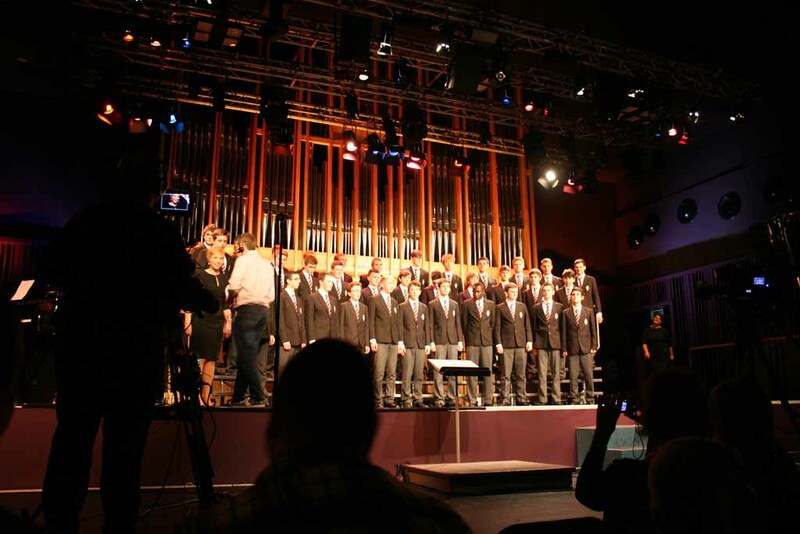 In recent years, choral singing has come to the fore, with all students being given the opportunity to take part in both choral and instrumental ensembles. In a school where hurling dominates, many boys were surprised that they could both hurl and sing! It was a revelation to many that choir practice could be such fun! In 2010, upwards of 130 singers were given major exposure and public accolades for their participation in the celebrations of the 150th anniversary of the foundation of the school. As a direct result of this, the Senior Choir was founded, with a view to providing a platform for those interested in achieving a higher standard of choral singing. Since then the choir has grown from strength to strength and has enjoyed many successes along the way. In 2012 the choir took part in a concert with Julie Feeney,in the Watergate Theatre. In 2013 a very successful Christmas Concert was held in St. John's Church, in aid of the CBS Zambian Project. In March 2014, both the Senior and Junior choirs enjoyed many successes at the Kilkenny Music Festival, the culmination being the winning of the coveted "Smithwick Cup" by the Senior Choir and also the "Rev. Sherin Trophy" for the most outstanding choir at the Festival. The present choir is made up of students from Transition year to 6th year. Rehearsals take place at lunchtime and after school. The motivation of this choir is the pursuit of excellence, with a strong emphasis on fun! Ben Thomson, Kevin Rowe, Cian Boyle, Joe Delaney, Aaron O’Neill, Antonio Artini, Jack Lawlor, Kevin Barrett, Joshua Shannon, Kevin Power, Shane O’Riordion, Sean Foley, Adam Kealy, Ryan Byrne, Tom Ryan, Ben Cuffe, Conor Cuffe, Neal Fennelly, Sean Heary, Jamie Hickey, Jonathan McGrath, Sam Gordon, Craig Byrne, Colin Dempsey, Rory Whyte, Barry Hennessey, Sean Lennon, Cormac Lehnen, Fergus O’Neill, Jim Moore, Matthew Lowth, Robert Murphy, Robert Galster, Tervine Wallace, Padraig Browne, Jack Eustace. Title: What Shall We Do With The Drunken Sailor? CBS Kilkenny is delighted that the Senior Choir has qualified for the All-Island Choir Competition which is an initiative organised by Cooperation Ireland and supported by RTE. Only twenty choirs progress to this stage from an entry of approximately eighty. The choir will be recorded in the competition on October 17th, 2014 in the Cork School of Music in CIT. The other finalists for the region are: Regina Mundi College, Cork; Glanmire COmmunity College, Cork; Cashel Community School and St. Leo's College, Carlow. This regional final will be transmitted on RTE1 television at 17:05 on November 9th, 2014. The winners of the four regional finals will participate in the Grand Final, due to be transmitted live on RTE1 at 18:30 from the Titanic Building in Belfast on Sunday 16th November 2014. Best of luck to the choir, Ms. Dowling and Ms. Evison. Well done! 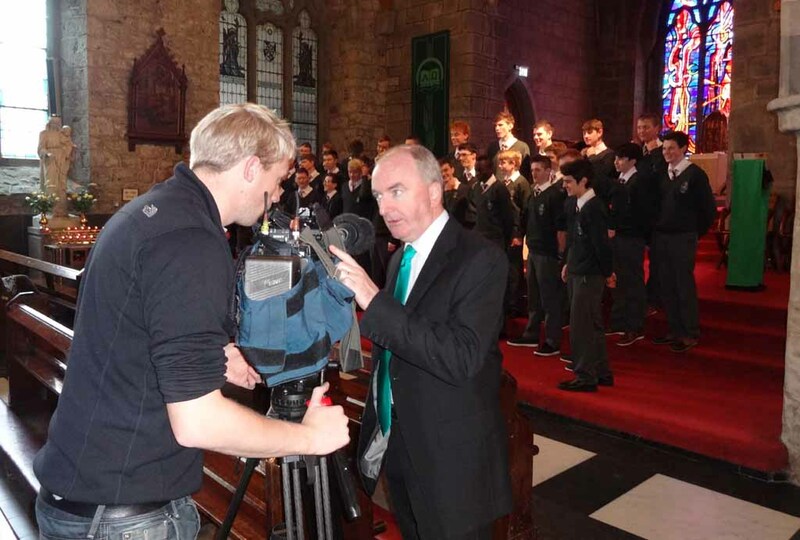 Tommie Gorman from RTE visited CBS Kilkenny today, accompanied by cameraman Peter, to film the preparations for the choir competition perfomance next week. Rehearsals are continuing apace under the guidance of Ms. Dowling and Ms. Evison. 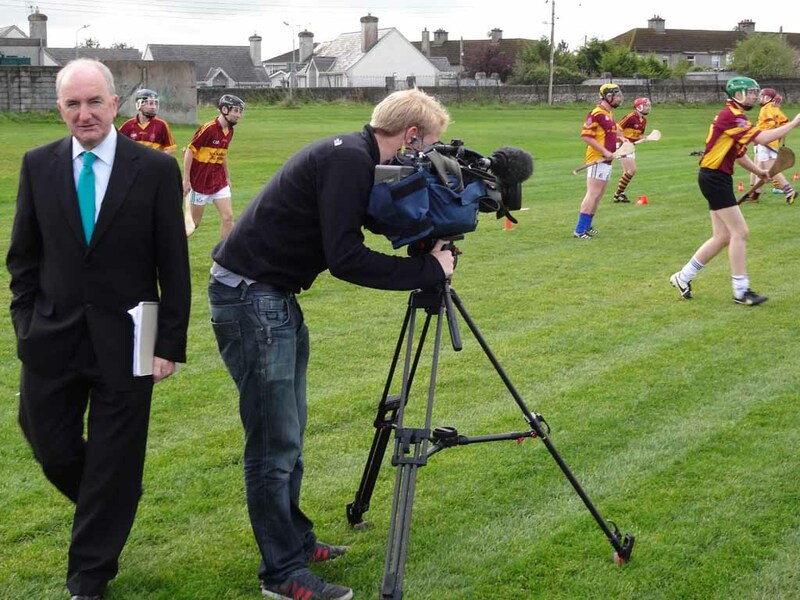 The filming continued to capture other aspects of life in CBS Kilkenny, including hurling practice where Tommie directed affairs! Best of luck lads. Enjoy the photos below.